Baldor’s compact mobile light tower provides 4000 watts of light anywhere you need it: Construction, Emergency, Industrial, Mining, Civil Engineering and Event Lighting. 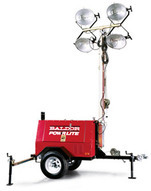 With metal-halide lamps the Baldor POW’R LITE models will provide light coverage for over 7 acres. Each model is powered by a Baldor 6000 watt light tower generator, which is designed for a compact and efficient installation. POW’R LITE light towers are powered by the dependable Kubota diesel engine. A 50-gallon fuel tank provides for 100-hours of operation. can be used for various types of applications: Construction, Emergency, Industrial, Mining, CivilEngineering, and Event Lighting. • 4 powerful 1000-Watt metal halide lamps. Lamps are supported on both ends to enhance durability and long life. • Elliptical light fixtures—provides a more efficient light pattern than conventional round fixtures. •Operator has extra 2000 watts to run jobsite equipment. Control panel includes one 120-volt GFI and one 240-volt twist-lock receptacle. •Enclosure constructed with heavy gauge painted aluminum. Padlockable door latches and integral forklift pockets included. •Zinc plated 30’ 4-section mast with coiled mast cords. Strategically positioned winch allows the telescoping tower to be erected from a standing position. •Tower rotates 360 degrees.•Quiet, dependable Kubota diesel engine provides “flicker-free” operation. •Tongue weight of 155 lbs. (with full load of fuel) allows one person to conveniently move unit around any jobsite. •50-gallon fuel tank included for up to 100 hours of running time. •Quality highway trailer suspension.•Low oil/high temperature shutdown protection and runtime hour indicator included. *For products covered under labor coverage, travel expenses will be allowed up to 7 hours straight labor or 300 miles, whichever occurs first, and only applies to permanently wired and mounted products (AE, DLC, GLC, IDLC). You must save the purchase receipt. Proof of purchase, date, serial number and model number will be required for all portable and Towable products to qualify for any warranty consideration. A start-up inspection form/warranty registration must be completed in its entirety and submitted to Baldor within 30 days of start-up to qualify for any warranty consideration, excluding: Portables, Towables and Light Towers. DIMENSIONS: 108" x 54" x 52"
DIMENSIONS: 121" x 54" x 57"